Today, we have a chance to visit Uncle Ho’s house. Nam Dan district, Kiem Lien village is not only the homeland of Ho Chi Minh but also the hometown of many anti-colonist leaders. Ride on the new Ho Chi Minh highway to Kiem Lien village via Tan Ky and Do Luong. Visit Uncle Ho house in the afternoon, have a short drive to Vinh city. Overnight in Vinh. In the morning, ride to Dong Loc, the T-junction, which has become unforgettable memorial history in the country during 1964-1972, when soldiers, young volunteers, cadres, and workers guaranteed safe transport to the battlefield. Many people from different localities laid down their lives. In particular, the death of 10 young volunteer girls at Dong Loc T-junction has come to symbolize the patriotism of the era. Now, Dong Loc T-junction relic has become a commemorative area for the national young volunteer force. In the afternoon, ride to Huong Khe. Start cycling from a hotel to Dong Hoi via Phong Nha World Heritage. Ride nearly 90 km winding roads up the Truong Son mountain range to Phong Nha. From here, if time permitting–cycle gentle rolling hills to Dong Hoi city. Today, we cycle south through the DMZ where Viet Cong and US soldiers clashed when the country was divided. Follow the eastern Ho Chi Minh trails to visit Truong Son cemetery, and cycle to Khe Sanh via Cam Lo. Overnight in Khe Sanh. Spend a whole day on visiting, explore the Forbidden Citadel, Royal Tombs of the Nguyen Dynasty and by bicycle in the morning. Ride on hilly country roads to Thanh Toan tile-roofed Bridge crosses a canal flowing from the beginning to the end of Thanh Toan village, Thuy Thanh Commune, Huong Thuy District. Start riding from Hoi An to My Son, the Champa Imperial city of the 4th to 12th centuries. Ride through rural villages to My Son, spend an hour visiting the large complex of religious ruins comprising more than 70 architectural remains. Transfer back to Hoi An for lunch. Free for shopping in town of Hoi An. A morning transfer to ocean villages on the outskirts of Quang Ngai. Ride through rice fields and rural villages and coconut tree plantations along the ocean. Lunch at a local restaurant, then continue an afternoon of riding on beautiful back roads through mountainous areas to the city of Qui Nhon. Transfer for 20 minutes to the city of Qui Nhon. Transfer 30 minutes to the suburb of Qui Nhon city, start cycling on back roads and racing with the Reunification train, rocking and rolling on bike on hilly back roads. Have a picnic lunch, continue your bike ride in the afternoon and finish today’s ride in countryside of Tuy Hoa. Transfer to Nha Trang in the late afternoon. Overnight in Nha Trang. Boat trip to the Island for swimming and snorkeling for the whole day.Lunch on the island .Boat back to Nha Trang free for swimming . Free in the evening. 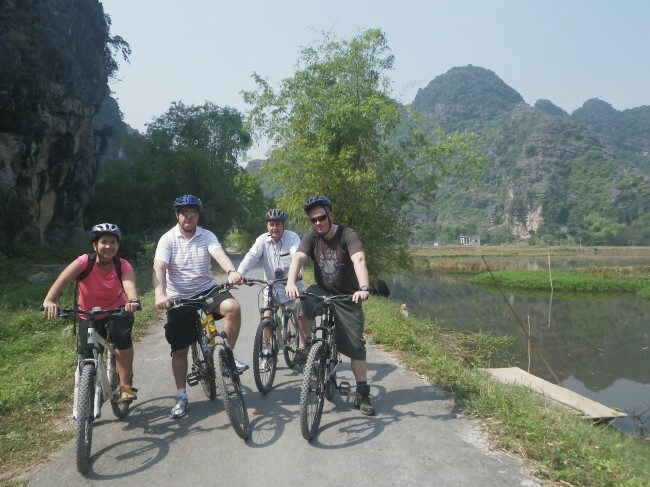 Transfer 30 minutes to Dien Khanh ancient town, start to pedal easily on back roads in the morning, pedal past brick factories, rice fields, and have lunch en route. In the afternoon, continue to pedal rolling hills, and cross Truong Son mountain range to Dalat. Overnight in Dalat. Enjoy a half-day city tour by bus/van in the morning. Visit Bao Dai palace, “Crazy House”, and the old French railway station. Lunch in town, in the afternoon, ride a 30 km loop on country roads, passing by flower gardens and strawberry plantations. Transfer for an hour south of Dalat. Ride on rolling hills through a valley, mountain area, hydroelectric power station and coffee plantations in the morning. In the afternoon, cycle down hill passing many minority villages and cashew garden as we head to to Phan Thiet. Starting your last day of cycling on asphalt coastal roads from countryside of Phan Thiet city to Mom Da Chim resort for lunch before a transfer to Saigon in late afternoon. Enjoy your own free time until transferring to airport. End of tour.